Attorneys Andres Alonso and David Krangle Announce that Alonso Krangle LLP has Filed a Lawsuit on Behalf of a North Carolina Woman Who Allegedly Suffered Metallosis Following Total Hip Replacement Surgery with the ASR XL Acetabular Hip Implant System Manufactured by DePuy Orthopaedics. Alonso Krangle LLP has filed a lawsuit on behalf of a North Carolina woman who allegedly suffered metallosis following total hip replacement surgery with DePuy Orthopaedic’s ASR XL Acetabular Hip Implant System. Attorneys Andres Alonso and David Krangle, founding partners of Alonso Krangle LLP, a national law firm focused on fighting for the rights of serious personal injury victims, announce their firm has filed a lawsuit on behalf of a North Carolina woman who allegedly suffered metallosis following total hip replacement surgery with DePuy Orthopaedic’s ASR XL Acetabular Hip Implant System. The lawsuit was filed on March 15, 2012, in U.S. District Court for the Northern District of Ohio (Case No. 1:12-dp-20642-DAK), where all lawsuits involving DePuy’s ASR Hip Implant System have been consolidated in a multidistrict litigation before the Honorable David A. Katz (MDL No. 2197). According to the lawsuit, the Plaintiff received the DePuy ASR XL Acetabular Hip Implant System in August 2008. Revision surgery to replace the ASR hip implant was performed in June of 2011. Alonso Krangle LLP continues to offer free lawsuit evaluations to anyone who suffered a severe injury, including cobalt poisoning, metallosis, or early failure of an implant, following total hip replacement with DePuy Orthopaedic’s ASR XL Acetabular Hip Implant System. To discuss a potential claim with one of the experienced and compassionate defective hip implant lawyers at Alonso Krangle LLP, please contact us at 1-800-403-6191 or visit our website, http://www.FightForVictims.com. Alonso Krangle LLP continues to offer free lawsuit evaluations to anyone who suffered a severe injury, including cobalt poisoning, metallosis, or early failure of an implant, following total hip replacement with a metal-on-metal hip implant, including DePuy Orthopaedic’s ASR XL Acetabular Hip Implant System. To discuss a potential claim with one of the experienced and compassionate defective hip implant lawyers at Alonso Krangle LLP, please contact us at 1-800-403-6191 or visit our website, http://www.FightForVictims.com. 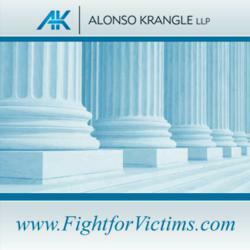 For more information about Alonso Krangle or to join the fight and be a part of our team, please contact us at 1-800-403-6191 or visit our website, http://www.FightForVictims.com.